The Halifax Public Gardens were transformed into the urban oasis of today by the amalgamation of two adjoining gardens, a swampy piece of wasteland and a lovely bequest from an estate. The driving force behind this transition was the passion for horticulture of a number of Haligonian citizens. Many were politicians who had the influence to realize their vision. The transformation began with the formation of The Nova Scotia Horticultural Society in 1836, under the advocacy of Joseph Howe, a politician and journalist. The NSHS’s aim was to advance the art of horticulture and the science of botany through the cultivation of new varieties of plants and cultural practices. Mr. Howe sought to have a garden for the society supported by public donations, and grants from legislature. Through his efforts a 5.5 acre piece of the Halifax Commons was provided to the society, free of rent in 1841. The cost of running the ‘People’s Garden’ quickly became overwhelming, and a decade after it’s opening, the NSHS had to find ways to support itself. It sold memberships for entry to its garden and only opened to the ‘people’ once a week. Twenty-five years later (1866) another politician, John MacCulloch, created the first city-owned public garden on a 2-acre piece of waste land adjacent to an artificial pond and the NSHS garden. While on a trip to Paris, Mr. MacCulloch fell in love with a public square, which he used as the basis for the design of the Public Garden, which was officially opened in 1867 by Chief Justice Sir William Young. The new Public Gardens continued to grow when a swampy piece of land to the north west of the artificial pond was filled in, and the City gave a grant of $2000 to pay for landscaping. Mr. McCulloch’s successor William Barron, also successfully set his sights on having the city purchase the People’s Garden owned by the deeply indebted NSHS. He combined it with the adjoining Public Garden. In 1872 Richard Power was hired as the superintendent of the Halifax Public Gardens and given the task of combining all these pieces into a harmonious whole. He began to implement his axially symmetrical plan in the Gardenesque style, in 1875 by planting 2000 trees from the existing stock of the NSHS nursery. Aleés were planted along the perimeter to delineate the Gardens, and the Grande Alleé was planted along it’s centre to merge the whole. The work continued for 4 years culminating with a more natural shape being carved out for the artificial pond, now known as Griffin’s pond. 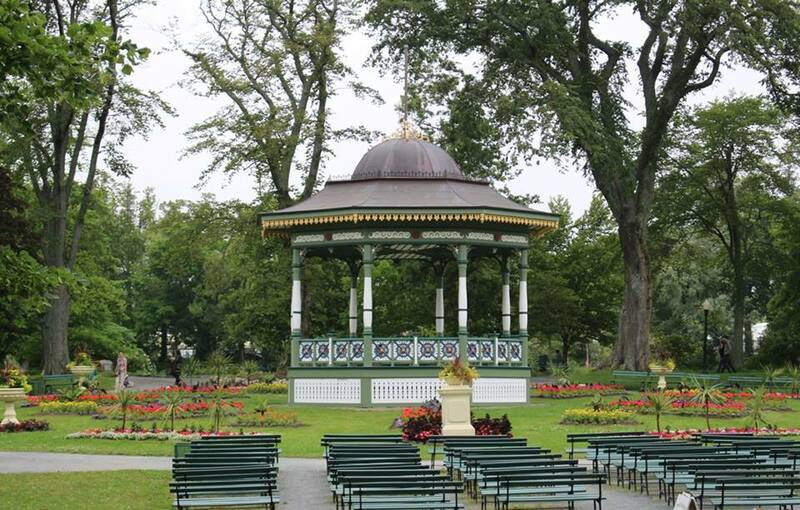 Many of the main features we associate with the Halifax Public Gardens were added after the completion of Richard Powers plan. Starting with the Bandstand in 1887, the next 24 years saw the addition of the Pavilion Entrance (for which the main wrought iron gates were ordered), followed by the Jubilee Fountain, the Boer War Memorial Fountain, the Gardener’s Lodge, the iron fencing around the perimeter of the Gardens and finally the concrete bridges. From that point (1911) to the restoration of the Halifax Public Gardens after Hurricane Juan in September 2003, little had been added. After Huricane Juan, new infrastructure replacement and renovation projects were undertaken. The restoration of Horticultural Hall and a new lighting system throughout the Gardens were completed, but no major features were added. The destruction by Hurricane Juan was the catalyst that brought about renewed interest, energy and love for this special treasure in the centre of our city. All this focus brought money to the Gardens thanks to a radio fundraiser organized by the newly former Public Gardens foundation which saw $1 million raised in a 48 hour period. A new entrance through Horticultural Hall Plaza was built, dominated by a fountain supported by swans. A new pumping system for Griffin’s pond was installed, some beds where re-shaped, the stream was widened and re-planted. The results are glorious and the talented gardeners and horticulturists at the Gardens have kept them looking vibrant. Restoration work always continues, that is the nature of a garden and its holdings. Many of the features in the Gardens are over a century old and in need of some tender loving care or merciful retirement. in 2012 included the addition of an environmentally sound re-circulating pumping system, as well as structural repair and finish restorations. 2014 saw the replacement of the Mr. Young’s urns with replicas moulded from the originals. Mr. Howe’s vision for the Nova Scotia Horticultural Society of a garden “supported by the public, grants from legislature, and donations” continues, with funding for these projects coming from various levels of government, sponsors and donations provided by The Friends of the Public Gardens. The remainder of this story is left to the caretakers and stakeholders of the future. in the centre of this city.